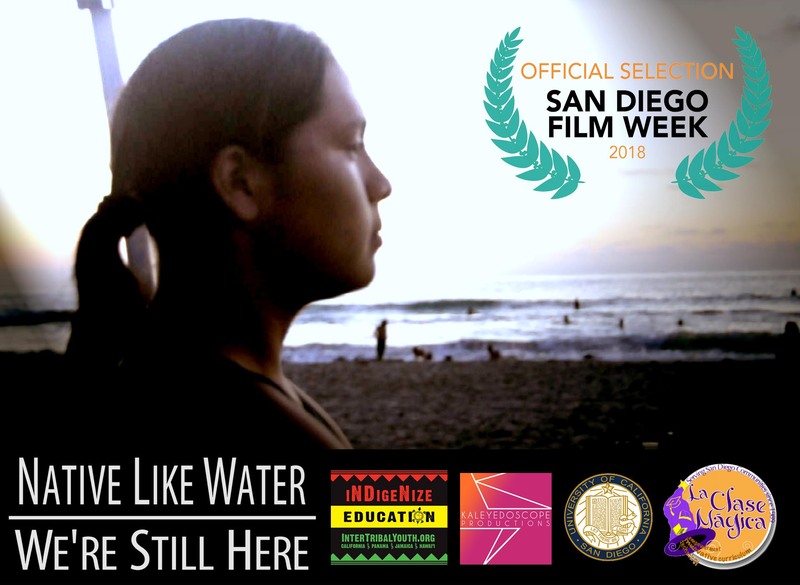 Native Like Water: We’re Still Here — a collaboration amongst Caroline Collins, Nalini Asha Biggs, and 23 Native youth representing over fifteen tribes from across California and Hawaii — and What’s My Line?, a film directed by Asha Biggs, will be screened at the San Diego Film Week on March 4 and 5, respectively. In their films, Asha Biggs and Collins, both PhD candidates in the Department of Communication, use innovative ethnographic methods in order to interrogate topics such as neuronormativity and historical erasures of indigeneity in the American west. “I was consciously gesturing to a core pedagogical philosophy, which adapts ethnographic traditions of participant-observation in order to deconstruct traditional hierarchies, promote mutual adaptation, and allow for the co-construction of knowledge with people who have been historically excluded from the academy and its modes of writing history,” explains Caroline Collins. Her film was co-produced with Asha Biggs and 23 Native students who were enrolled in a summer camp for indigenous youth at UC San Diego. The camp was facilitated by the non-profit organization InterTribal Youth (ITY) and La Clase Mágica at UCSD. In addition to working on the film, “the students took surf lessons, camped at a local Kumeyaay reservation, and learned about Native ecology,” recalls Collins. In her film, What’s my Line? Nalini Asha Biggs interrogates practices of looking and feeling that many people assume are natural and eternal. “When it comes to film conventions, there are a lot of neurotypical norms that we assume are universal and natural,” Asha Biggs explains. “For example, many people working in film assume that faces and eyes are the most important thing to see in a person, that and character development.” It is those sorts of unexamined assumptions that Asha Biggs is challenging in both her film and her academic research. “When someone says a film is a ‘gritty character study’ I run screaming. Everyone needs something different from films. For me, it’s production design. I need to look at things that for me feel ‘pretty.’ I like symmetry, for example, and opulence, textures, and studies of color. Color is the story for me. 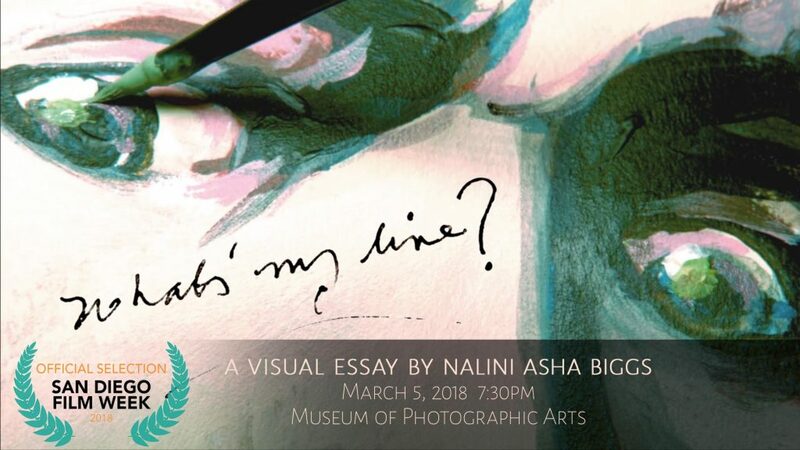 So this film uses the spectrum of colors found in light to tell a chromatic story of the artifacts I encounter daily and that drive my color desires,” Asha Biggs shares. Asha Biggs’s film is also connected to aspects of her dissertation research that focus on “stimming.” “To ‘stim’ or ‘stimulate’ is treated as a ‘symptom’ of Autism by the medical and educational communities,” Asha Biggs explains. “But many people who identify as Autistic, as I do, reject this ‘cure culture’ lens and the objectifications that it entails. Within Autistic culture, stimming is an extremely important practice. It is something that helps define our identity, it is a practice of wellness, and it is a symbol of difference in a world not designed for us. Without using the word, I wanted to take the audience through my own experience of stimming off color and art making,” Asha Biggs details. Both Caroline and Nalini see filmmaking as a legitimate way to conduct and present scholarly research. For Nalini, What’s my Line? was an opportunity to push beyond accepted academic conventions. “The intended audience was other Autistic people and those who stim for generally. Making the film forced me to try challenge neuronormative standards as well as the temptation to ‘explain’ myself in normative terms. In a related vein, my text-based research explores how others do something similar by using visually focused social media sites like Instagram,” elucidates Nalini.